The always awesome Purple House Press is offering up the next selection in the Great Holiday Give. 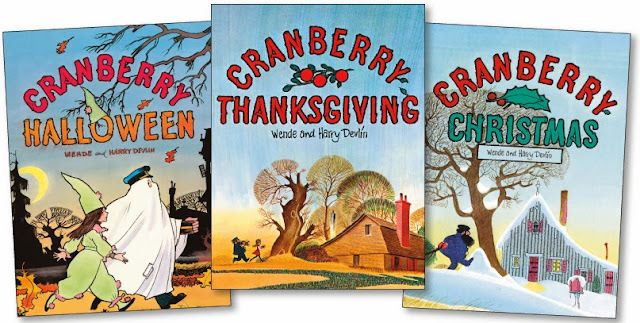 Today's winner will receive all three titles of the recently reprinted and much-beloved Cranberryport series by Harry and Wende Devlin: Cranberry Christmas, Cranberry Thanksgiving, and Cranberry Halloween. This couple are also the authors of two of my all time favorite children's books from my childhood, How Fletcher Was Hatched and Old Black Witch. So.... to win your very own brand spanking new copies of these totally timeless holiday favorites, simply comment on this post before midnight CT on Sunday, November 24. A winner for this give (and the other four daily gives) will be selected at random and the winners will be announced a week from today, Monday the 25th. Make sure you check back on Monday's post to find out if you're a winner! we'd love these at our house! This would be great for my boys! Oh, cool! We have only read Cranberry Thanksgiving, as it's the only one our library has. wow, such a great gift! Purple House Press is awesome! Excellent! I have a friend who would die to get a copy of Cranberry Thanksgiving (which I already have and could give her) and I would LOVE the other two to round out my collection!! I would love to add some more awesome books to our already full bookshelves! Never heard of them, but saw an excerpt on Amazon. So I'm in! We LOVE the Cranberryport series and would be delighted to win these books! Hooray for the Devlins! So glad these are available. I love, love, love, the Cranberry books! We have a lot of these in paperback, we'd love to update them! We'd love to update our old paperbacks! I would absolutely love these for my class. So sweet and homey looking. What a fun package! My boys would love them! These books also sound like a lot of fun! I have put these in my shopping cart a couple times, but never pulled the trgger. I would love to win! My kiddo would love these books! Thanks for such an awesome giveaway ! Still one of my favorite books for Thanksgiving. I'd love to win! These look great! These make my heart happy! What a fabulous giveaway! These books make my heart happy! What a fabulous prize! I LOVE these books! Read the Devlins til I almost wore the spines out of their books:) They are classic! These look so cute. I would love to win. I would love to own these books for my son! They look fantastic! would love to own the cranberryport book series for my son. sounds like a perfect gift for the holidays! I'd love to wine this series! Thanks for the opportunity! I would love to get these Harry Devlin books--we don't have them! We just discovered these this year, and my son loves them! I'd lowe to read them! THank you! These look like so much fun! Thanks so much for the chance!